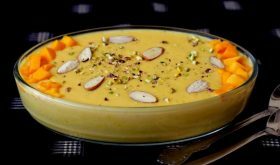 Mango rabri recipe is a simple dish with minimal ingredients yet high on flavor. A rich, creamy, fruity, tradtional Indian dessert with a soft pudding like texture. 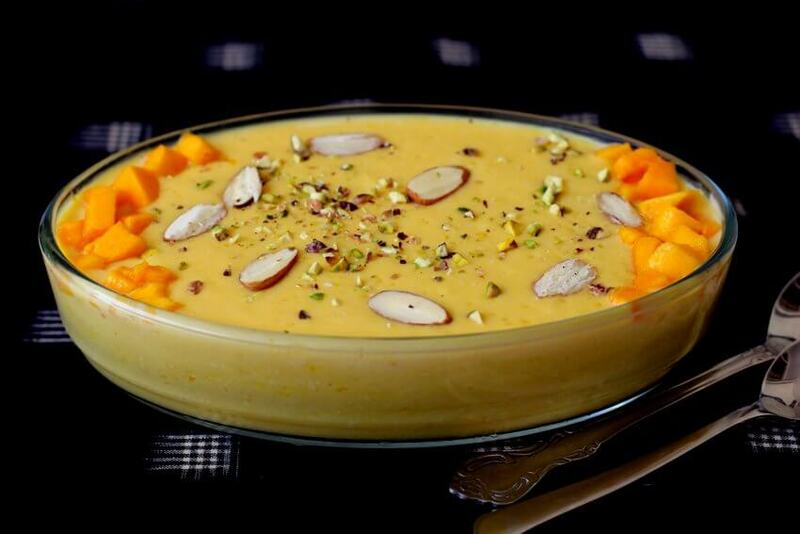 A heavenly combination of creamy rabri, fruity mango and aromatic saffron. An easy, summertime dessert that puts the season’s best fruit to good use. The traditional way of making rabri does take time as milk has to cook on slow fire till it reduces to one-third of its original quantity and becomes a thick mixture. The mango puree once blended into the reduced milk gives an impressive texture. Rabri is versatile as you can add a variety of fruity flavors as add-ins. Mango rabri has the right amount of sweetness, creamy with fragrant mango tones providing a comforting goodness that only the king of fruits can. 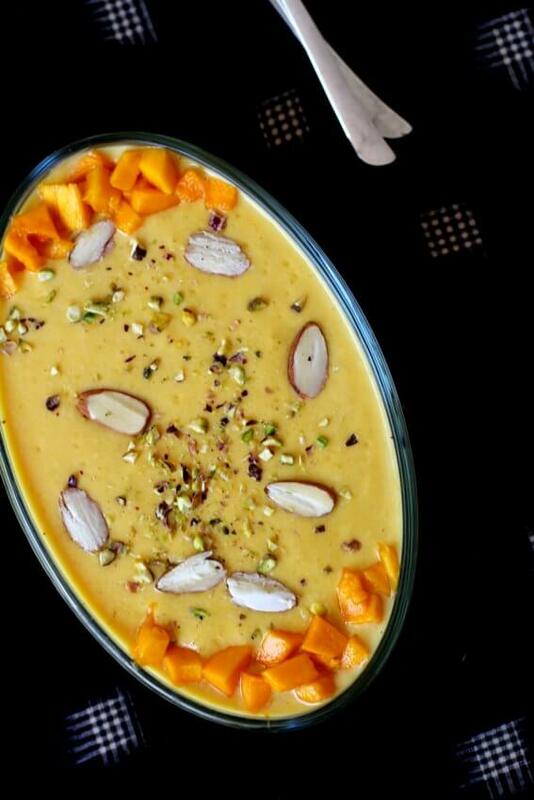 It makes for a top class mango dessert garnished with flaked almonds, chopped pistachios and chopped mangoes. A perfect party dessert too. You can follow the quicker route to make aam ki rabri by using condensed milk which is equally delicious. Use good quality sweet mangoes and not the ones which have a sweet-tart flavor. Since mangoes are sweet, use of sugar is minimal. I wouldn’t advise using canned mango pulp. Use freshly pureed mangoes. I like it chilled, so the longer it sits in the fridge, the better the flavor. Boil milk in a large heavy bottomed wide vessel. Once it comes to a boil, reduce to low heat and allow to simmer. Keep stirring at regular intervals, pushing the layer of malai (top of milk) that forms on the top towards the sides of the vessel. Continue to do this till the milk is reduced to less than half of the original quantity. After almost 60-70 mins or so, the milk would have reduced considerably to a thick mass. Add sugar and half of the chopped nuts and mix. Allow the sugar to dissolve and continue to simmer the mixture till it reaches a third of the original quantity. Add the mango puree and mix well till well combined. Remove to a bowl and chill for a couple of hours. You can also serve at room temperature. Garnish with the remaining chopped pistachios, almond flakes and chopped mango pieces. 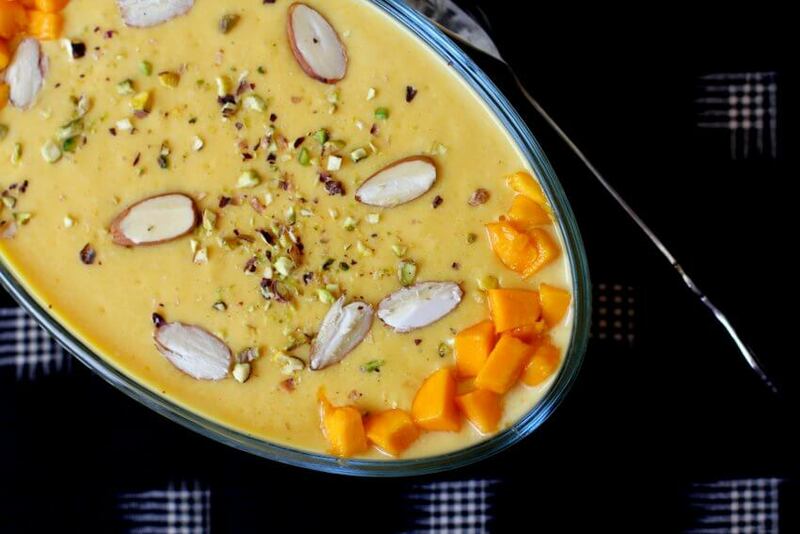 Ladle the mango rabri into serving bowls and serve chilled. Any left-over rabri can be stored in the fridge for 3 to 4 days or frozen for a few weeks. 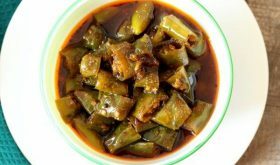 wow nice recipe.Those who love mangoes can try out this recipe for a change. if we use condensed milk, how much time do we need to boil the mixture? I love mango. Its looking so yummy, I will try to make it. I have tried mango rabri recipe, also i have use saffroind brand saffron. The aroma of saffron is awesome.In all very tasty & will try this every summer.